Hey, Folks! Today we warmly welcome our guest blogger-extraordinaire, Mark Ordon! Mark is a translator, writer and an enthusiastic reader who lives with his family in Poland. Welcome, Mark. 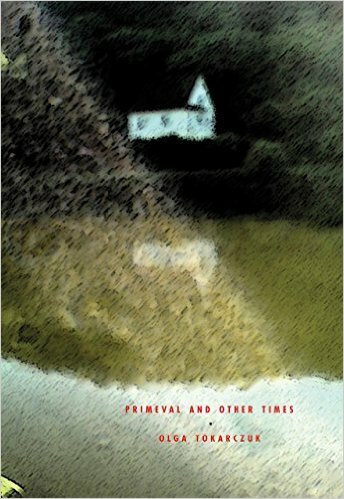 Today Mark discusses the acclaimed novel Primeval and Other Times by the phenomenal author Olga Tokarczuk. Check out his video! . . .I love how you can enjoy this book on several levels – historical, cultural, or even metaphysical, says Ordon. Olga Tokarczuk, born 29 January 1962, is a native of Sulechów, a town in southwest Poland. She is one of the most critically acclaimed and commercially successful Polish writers of her generation,particularly noted for the hallmark mythical tone of her writing. Tokarczuk trained as a psychologist at the University of Warsaw. Awarded the Polityka Passport Prize in 1996 and the Koscielski Prize in 1997, the author became established her as a leading voice in Polish letters. Having finished her studies at the University of Warsaw, she now lives and writes in small village near the town of Nowa Ruda. She has been an active writer for over 20 years and has published a number of successful novels, essays and short stories, which while often cloaked in historical or mythical settings, touch on contemporary social issues. The author has published a collection of poems, several novels, as well as other books with shorter prose works. Her book Bieguni (“Runners”) won the Nike Award 2008. She attended the 2010 Edinburgh Book Festival to discuss her book Primeval and Other Times and other work. For her recent novel Księgi jakubowe (“Jacob’s Scriptures”), Tokarczuk won the Nike Award again in 2015. Also in 2015, she became a recipient of the German-Polish International Bridge Prize, a recognition extended to persons especially accomplished in the promotion of peace, democratic development and mutual understanding among the people and nations of Europe. Mark Ordon grew up in a bilingual and bi cultural family in Detroit, Michigan. He pursued his interests in foreign language and culture, with special focus on literature from Poland, the country of his ancestors. Though focused first on classic pieces, he quickly discovered the wealth of contemporary Polish literature. He now works as a full-time translator, sometimes journalist and writer, and lives with his family near Poznań, in western Poland. Though much of Mark’s work concerns technical subjects, he has been shifting focus to translations of excerpts and sample texts from Polish and German literature in an effort to introduce these valuable works to readers in the English language realm. Thank you for your good work, Mark, and for bringing the voices of phenomenal authors such as Tokarczuk to our attention! Do you have a favorite woman author you’d like to blog about? Let us know . . . you could be our next guest contributor! Let’s keep the conversation growing! Enjoyed being introduced to such a prolific Polish writer/poet, thanks Mark. Enjoyed Mark’s review, thorough, and I’m curious what other works from this author he might recommend. Thank you, David, I’m glad you enjoyed the review and that I managed to spark your interest in the author! In terms of what’s available in English, in addition to “Primeval”, I would suggest “House of Day House of Night”, written in the form of a journal of sorts, but with the mystical twist and in-depth look into people that Olga Tokarczuk is so good at. A few of her shorter works have been published online (links in article above). And, around mid-year, you can expect the publication of yet another novel, “Flights”. On a side note, if you’re a movie buff, an adaptation of Tokarczuk’s novel (“Drive Your Plough over the Bones of the Dead”), a bit of a thriller, will be released soon (more info: http://en.pisf.pl/news/agnieszka-holland-s-pokot-spoor-premieres-in-main-competition-at-67th-berlinale?wcag=1). Thanks again for your positive feedback! Hello there, I discovered your blog via Google while looking for a comparable topic, your site came up, it appears to be like great. I have bookmarked it in my google bookmarks.